It is amazing in just the last few years since I completed "Petroliana...On Location" (which was intended to be a comprehensive catalogue of pre-war petroliana) how much has surfaced since that time. "Hidden Treasures" is my attempt to fill some of the gaps in my previous books. However, as it would be pointless to reproduce all the items previously listed in "On Location", and to get the maximum information, you will need to have a copy of that book. 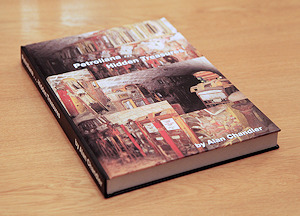 "Petroliana...Hidden Treasures" contains 950 new pictures and is again in full colour and hard back bound. These two books together provide the most comprehensive catalogue of British petroliana ever produced. Once again, I hope you enjoy my latest book. Choose your location and quantity required then click "Buy Now"